The Mahasiddha Tilopa is said to have lived between 988-1069 B.C. In the documents compiled by his followers, reference has been made to Bengal as his birthplace. Tilopa has been particularly credited for conceptualising the Mahamudra. It is a meditational method, which involves a set of spiritual practices that expedite the process of attaining bodhi or enlightenment. Tilopa is devotionally looked upon as the first human founder of the Kagyu Lineage of Tibetan Buddhism. 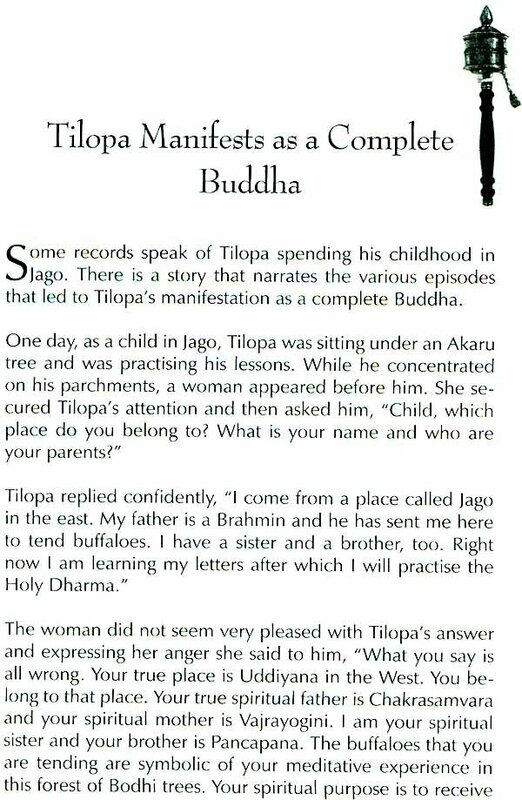 Just like Buddha Sakyamuni, the first Buddha, T ilopa also achieved the state of complete realisation without the intervention or guidance of a human master. It is said that Lord Buddha himself directly transferred Tilopa to the state of complete consciousness. The Mahasiddha Tilopa is said to have lived between 988-1069 B.C.. In the documents compiled by his followers, reference has been made to Bengal is his birthplace. While the region holds common to all documents and records, there variation in the family he was born to. 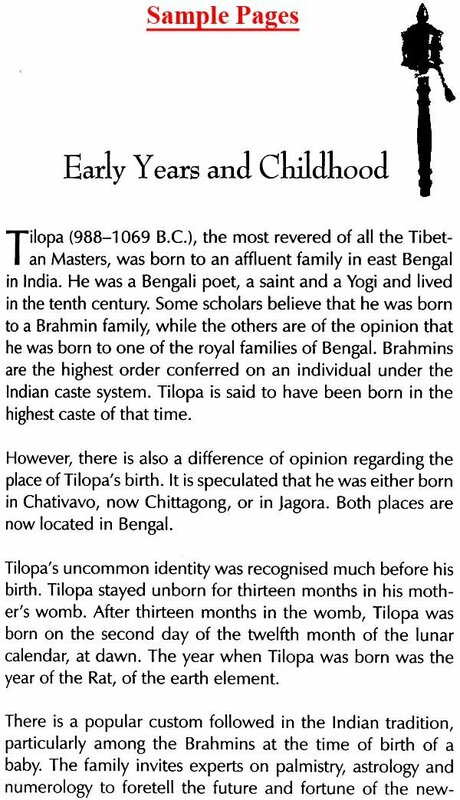 While some records read of Tilopa being born to a royal family, it is more commonly known that he was born in Brahmin family of Bengal. Tilopa has been particularly credited for conceptualising the Mahamudra. It is a meditational method, which involves a set of spiritual practices that expedite the process of attaining bodhi or enlightenment. Tilopa is devotionally looked upon as the first human founder of the Kagyu Lineage of Tibetan Buddhsm. Just like Buddha Sakyamuni, the first Buddha, Tilopa also achieved the state of complete realisation without the intervention or guidance of a human master. It is said that Lord Buddha Himself directly transferred tilopa to the state of complete consciousness. It is believed that for long, tilopa’s parents were not blessed with a child. Disheartened and discouraged, they prayed to the Yidam chakrasamvara as their last hope. 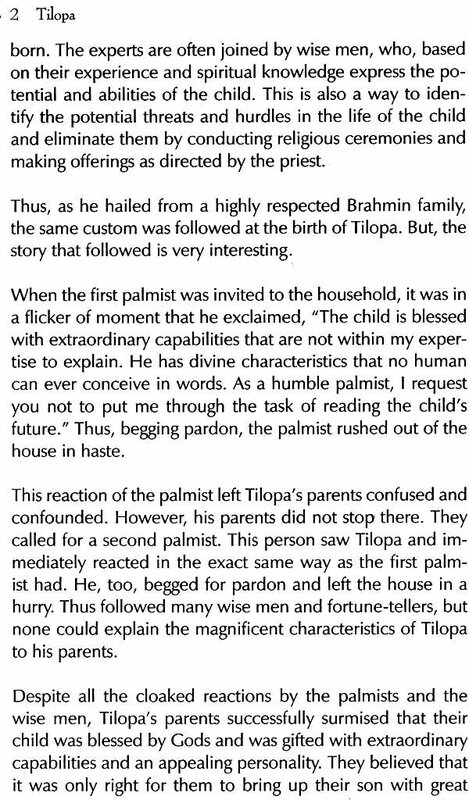 Pleased, the Yidam blessed the couple with a baby boy who was later known as Tilopa. Even at birth, Tilopa bore a pleasant and divine countenance that was perceived by all. His parents had invited palmists and astrologers to the royal house to read Tilopa’s future at h is birth. They all had predicted in a convert fashion that Tilopa would attain the state of superior divine consciousness in his lifetime. However there is also a belief that the celestial figure of an old lady occasionally appeared and advised Tilopa. As per her suggestion, Tilopa was asked to take a herd of cows for grazing to nearby pastures. Just as the old lady had prophesised , Tilopa would first confront divine intervention while grazing cows. And, the prophecy like all other previous revelations by the old lady held true. As a young herdsman, when Tilopa was grazing his cows, he accidentally met the great Bodhisattva Nagarjun. It was under the guidance of Nagarjuna that Tilopa received his preliminary teachings on the Mahayana path. After Nagarjuna had imparted the teaching to Tilopa to his satisfaction, he appointed him as the ruler of his kingdom in Bhalenta. For many year, Tilopa ruled the kingdom of Bhalenta with wisdom, glory and foresight. However, despite all the luxuries and power he commanded, Tilopa was not happy and content. There was always a lingering feeling in him that he should embark on the path of spirituality. So one fine day, Tilopa renounced all his worldly charges and embraced the life of a monk. He travelled to a tantric temple of Somapuri, situated in Bengal and took his ordination oaths. After this he attended monastic teachings and lived a monastic way of life. Soon after Tilopa ordained himself as a monk he experienced a vision, wherein a Dakini guided him on the much coveted, mystical and obscure path of enlightenment. 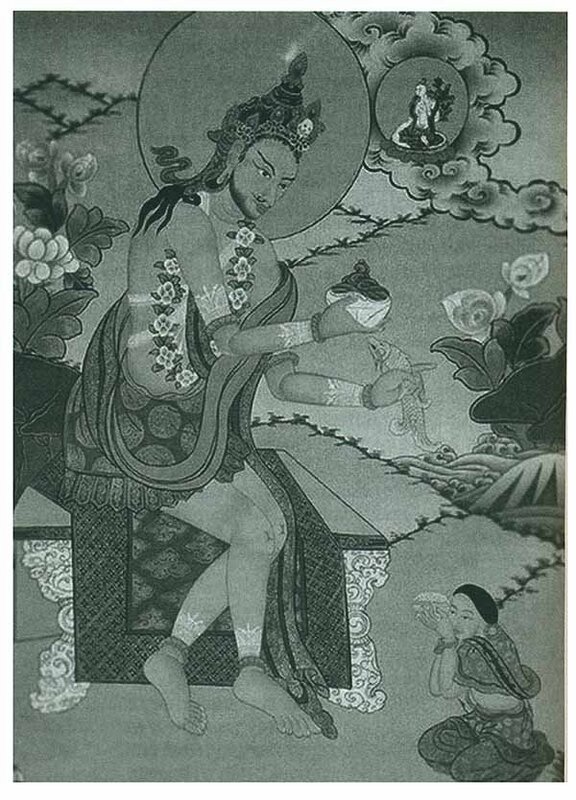 From the same Dakini, Tilopa received the entire transmission of the chakrasamvara Tantra. The Practice of Bardo:The intermediate state between death and re-birth. The Practice of Phowa:The Transfer of consciousness. The Practice of Tummo:The Practice of Inner Incandescence. At different stages of his spiritual journey, Tilopa had many human masters whose guidance was significant to his progression on the divine path. However, his root guru was Buddha Vajradhara. Buddha Vajradhara Transmitted directly to Tilopa many esoteric teachings that helped him become one with the enlightened one. 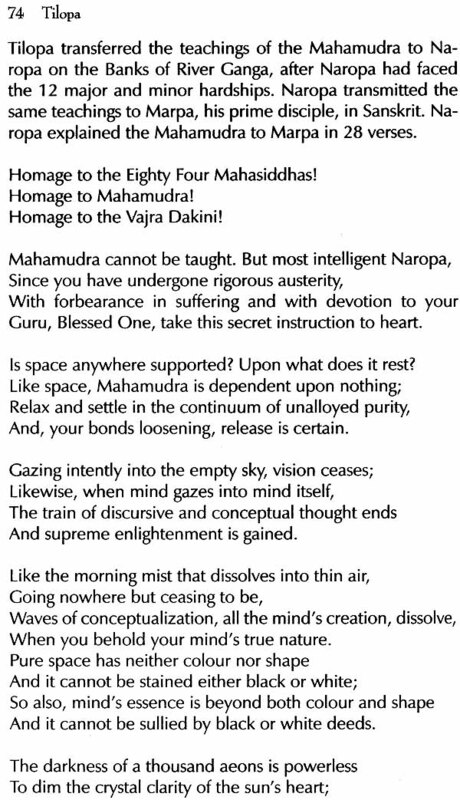 Of all the teachings, the practice of Mahamudra was most coveted and sought after by Tilopa. 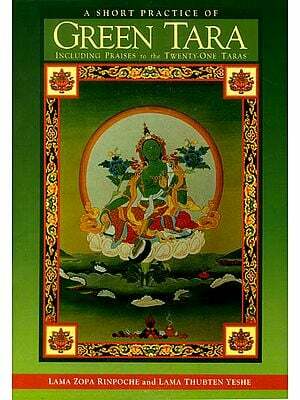 For twelve long years, Tilopa practised the teachings with dedication and undying devotion. During this period, he was also engaged in secret consort with a Yogini from the same monastic order as his. When the secret was discovered by the monastic order, they expelled him due to his behaviour that was unacceptable to them. After being expelled from the monastery, Tilopa assimilated a large group of followers as he travelled from one place to another. 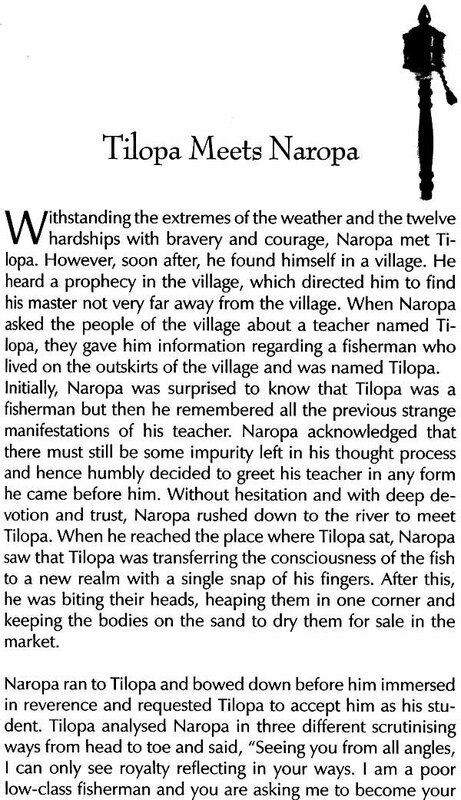 Of all his trusted devotees, Tilopa chose Mahapandita Naropa to continued his lineage. Nagarjuna also known as the second Buddha transmitted to Tilopa Sangwa Dupa or the Guhyasamaj Tantra and the Denshi Tantra. 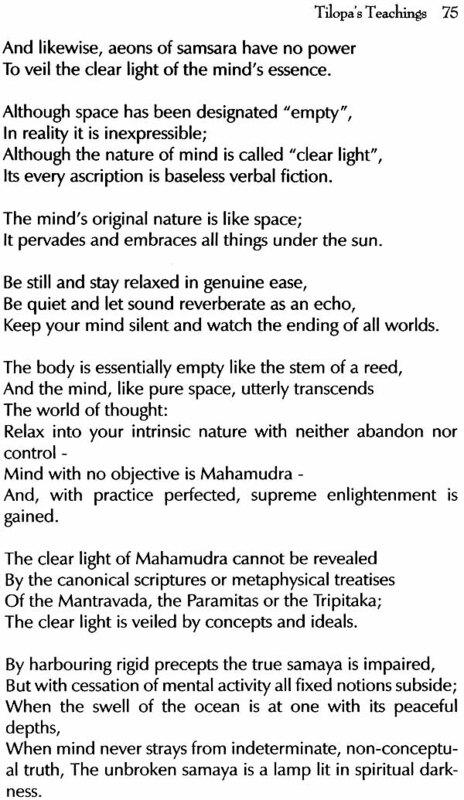 This transmission helped Tilopa learn, transference of consciousness. From Master Nagpopa, Tilopa Learnt the Mahamaya Tantra that taught him the art of conscious dreaming. Master Luipa taught tilopa the Demchok Tantra and the practice of clear light. Lastly from the female master, Khandrom Kalpa Zangmo, Tilopa learnt the Hevajra Tantra and Transmission of heat generation.